Not a lot of change to report, which is good! Kate continues on the same dose of steroids, 1.5mg per day; her aphasia and memory issues continue to be frustrating but not incapacitating, and her endurance, speed, strength, and balance are still much better than they were. She hasn’t used the walker in over a month and is getting around well with a cane. Sometimes she even forgets the cane and doesn’t notice for a while, which is a good sign although she should still use it for balance when walking outdoors. Her blood sugar is also well under control. We have done a lot of travel this month, with both of us attending the Nebulas in Chicago and Wiscon in Madison, followed by a few days in Milwaukee with my dad. There was a lot of napping (for both of us!) on the trip, but otherwise she coped with the stress of travel quite well. I also spent a weekend in Seattle without her, and this time we did not have anyone stay with her while I was gone. This went well, so we’ll be doing the same for my solo travel going forward. I’ll be contacting local people with more information about helping Kate while I’m out of town, but if you are planning a visit to Portland during June or July you should let us know — she (or we, if I’m in town) would love to see you. I’m very glad Kate is doing so well now, because my first novel “Arabella of Mars” releases on July 12 and there’s a lot to do to promote that (plus finishing up book 2 at about the same time). 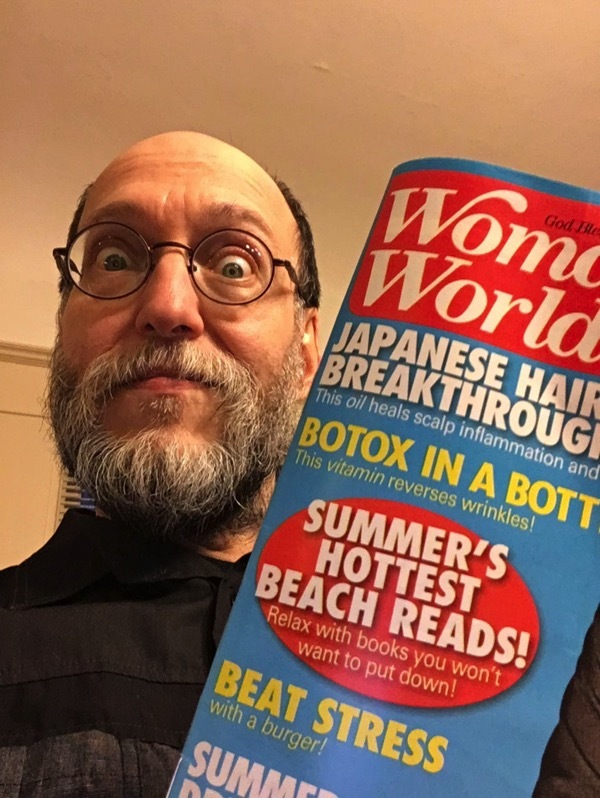 I will be one of the Guests of Honor at the Westercon in Portland over the Fourth of July weekend, and I’ll be reading at Powell’s Cedar Hills on July 13 and the University Book Store in Seattle on July 29. Other book tour stops include San Diego, Los Angeles, New York, San Francisco, and beautiful Bainbridge Island. My full book tour schedule is here. Kate will be accompanying me on most of this travel. Thanks to Mary, Mark, Melissa, Michelle, Sara, Geri, Rick, Marc & Patty, Bo, Anne, Ariel & Phil, and everyone else who helped out or shared a meal in May. We couldn’t do this without you. Debbie Notkin, W. L. Bolm, Ariel Franklin-Hudson, David D. Levine. We all get sick of love triangles in our fiction. We often find ourselves wishing the characters in these triangles, and other assorted shapes, would just go poly and love each other freely. But we also know that poly just doesn’t always work like that in reality. Not everyone has the propensity towards polyamory. Sometimes the genders and orientations just don’t match up. And very often, some of the characters who are in love with the same person couldn’t stand to be in the same room together even before they fell for the same person—much less attempt an honest and intimate relationship together. Are there good dramatic (or comedic) reasons to employ love triangles? What other ways could we attempt to fix them? Do they need fixing? How would making them poly change them? Claire Humphrey, Keffy R. M. Kehrli, Gary Kloster, David D. Levine, Gabriel Murray, Gabriela Santiago. GlitterShip is a podcast and magazine of LGBTQIA+ short fiction. Come listen to a selection of works by authors whose stories have appeared on GlitterShip! Ellen Kushner, Eleanor A. Arnason, Eugene Fischer, Colleen Booker Halverson, David D. Levine. From “infodump” to “the edges of ideas,” readers and writers of science fiction and fantasy have a number of ways to describe exposition. But how do we actually write it? What’s the difference between an “infodump” and a well-written description? What does “show, don’t tell” actually mean? What are the specific exposition challenges that we face as writers of speculative fiction–and how do we solve them? 05-26-2016 at 07:07 AM Comments Off on Wiscon Ho! Holy cow, things are really heating up for Arabella of Mars! I just got back from the Nebula Awards weekend and Book Expo America in Chicago. Although I did not win a Nebula, everything else went great. Between the two conferences I gave out nearly 100 signed ARCs of Arabella to booksellers, librarians, educators, bloggers, writers, and readers, many of whom were very enthusiastic about the book. Best moment of the weekend was when a girl of about 12 came to the SFWA table at BEA looking for an age-appropriate book. None of the books on the table were appropriate for her, but I pulled one of my two remaining copies of Arabella out of my bag and asked if the cover appealed to her. She said it did, very much so, and when I inscribed and signed it and gave it to her she literally squee’d and clutched it to her chest. There was also much excellent programming and hanging out with writer-folk. Arabella was just named one of “Summer’s Hottest Beach Reads” by supermarket tabloid Woman’s World, circulation 1.6 million. It’s in the current (May 30) issue, available at a check-out stand near you. Arabella was one of 14 titles listed and only two SF/Fantasy! I’ll have to try that Japanese hair breakthrough, just as soon as I’ve beaten stress with a burger. Tor is also doing a Goodreads Giveaway of nine copies of the book. You can enter here until June 17. I have also added six new appearances to my Upcoming Appearances page just in the last week: the Locus Awards; a Reddit AMA; readings at Mysterious Galaxy in San Diego, Eagle Harbor Books on Bainbridge Island, and SF in SF in San Francisco; and a one-day workshop for Clarion West in Seattle. May 27-30, 2016: WisCon 40, Madison, Wisconsin. June 24-26, 2016: Locus Awards, Seattle, Washington. July 1-4, 2016: Westercon 69, Portland, Oregon. Fan Guest of Honor. July 13, 2016: Powell’s Cedar Hills, Portland, Oregon. July 14, 2016: Reddit AMA, reddit.com. July 15, 2016: Mysterious Galaxy, San Diego, California. July 16, 2016: Shades & Shadows Reading Series, Los Angeles, California. July 20, 2016: Fantastic Fiction at KGB, New York, New York. July 28, 2016: Eagle Harbor Books, Bainbridge Island, Washington. July 29, 2016: University Book Store, Seattle, Washington. August 13, 2016: Writers with Drinks, San Francisco, California. August 14, 2016: SF in SF, San Francisco, CA. August 17-21, 2016: MidAmeriCon II (Worldcon), Kansas City, Missouri. August 30, 2016: SFWA Pacific Northwest Reading Series, Seattle, Washington. September 1, 2016: SFWA Pacific Northwest Reading Series, Portland, Oregon. October 27-30, 2016: World Fantasy Convention 2016, Columbus, Ohio. November 18-20, 2016: OryCon 38, Portland, Oregon. December 4, 2016: Clarion West One-Day Workshop, Seattle, Washington. And there might even be a few more! I just had to turn down an invitation to a library conference in Arkansas due to a conflict. There are also three more cool things in progress which I cannot yet share with you, but I have seen early drafts of all of them in the past day and they just give me chills. Arabella of Mars launches July 12! You can pre-order it now from Amazon, Powell’s, or the University Book Store. 05-20-2016 at 10:38 AM Comments Off on Arabella publicity news! As long as I am in Chicago, I will also be appearing at Book Expo America, signing ARCs of Arabella of Mars Friday May 13, 1:00-2:00 pm at autograph table 7. I had a colonoscopy yesterday. The prep was pretty miserable, but the procedure itself was nothing (literally — I slept through it). Four small polyps were found and removed. I’m awaiting lab results on those, but the doctor said they were of no concern whatsoever. The other piece of good news I received when I got out of the recovery room was this: Publishers Weekly gave a starred review to Arabella of Mars! I don’t know what percentage of books get a starred review, but it’s not very large — this was the only one for a Tor book this week. 05-10-2016 at 09:19 AM Comments Off on Starred review for Arabella! Not a lot to report this month, which is good. Kate just had another MRI and it continues stable, so we have cranked the steroids down another notch. She is now taking 2mg/1mg on alternate days, down from 8mg a day all last year. With luck we will eventually be able to get her off of the steroids and their nasty side effects completely. There is still some aphasia, and memory and cognitive issues, but they vary a lot depending on time of day, energy level, and who she’s talking to, so it’s hard to say whether they are improving or staying the same. I think there’s some improvement, but it’s slow. Her strength and balance continue to improve; she is now getting around using only a cane, and hasn’t used the walker in over a month. She is now rated as an “independent community ambulator” by the physical therapist and has gone on a few walks by herself. Things are going well enough that she is now only seeing the PT every other week, and the naturopath every other month. As for me, I’m now on a “call me if you need to see me” schedule with my psychologist. We haven’t had any travel in the last month, but we did see some live theatre (I particularly enjoyed “The Pianist of Willesden Lane” and the lumberjack circus “Timber!”). May will be a busy month, though: we are going to Chicago next week for the Nebula Awards weekend and Book Expo America, then to Madison two weeks after that for Wiscon, followed by a few days in Milwaukee with my dad. Thanks to Melissa, Teresa, Joyce, Geri, Will, Patty & Sean, John, Shannon, Chip & John, Karen, Robin & Dave, Bo & Don, Marti, Sara, and everyone else who came by for a walk or a visit or shared a meal. 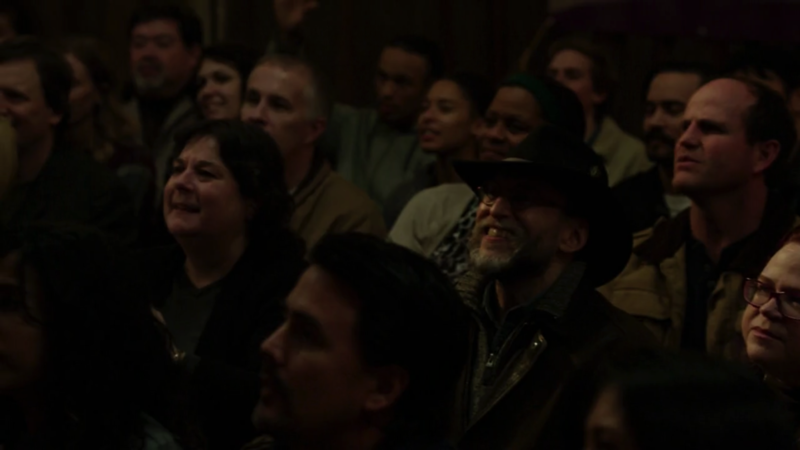 Back in January, I got a call to be an extra on Grimm and, for a wonder, I was able to make it. 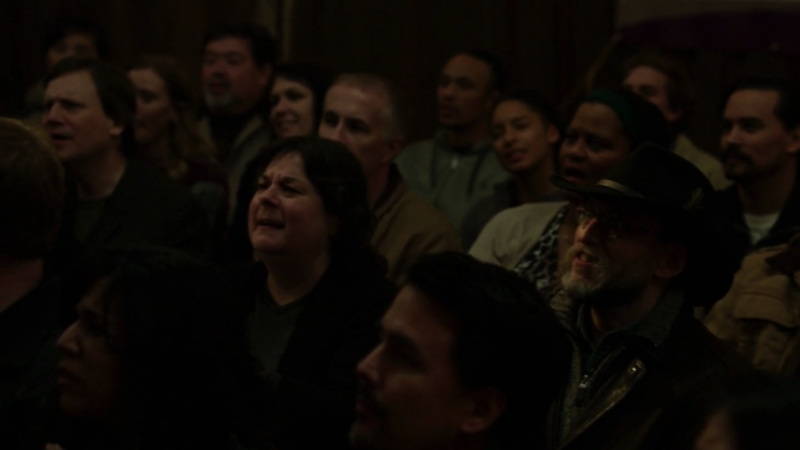 I worked all day — and when I say “worked” I mean mostly sitting around waiting for stuff to happen — and when the episode, “The Believer,” finally aired two weeks ago I was in about one second of footage. But it was a critical second. PREACHER: Do you feel the love in your hearts? The job of extras is to make a scene feel real. In this case it was a huge group — over 100 people — and I did my tiny part of contributing to that energy, that noise, and that “feeling” of a tent revival, even if I personally didn’t appear on camera very much, so I am satisfied with my work. I had a good time, I got paid for it, and I would do it again. “Damage” is a Sturgeon nominee! I’m very pleased to announce that my short story “Damage” is a nominee for the Theodore Sturgeon Memorial Award! 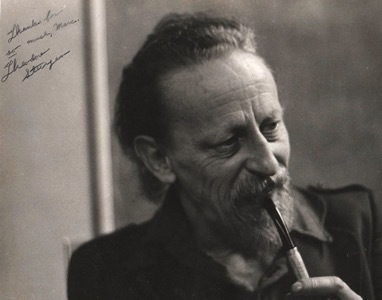 The Theodore Sturgeon Memorial Award for the best short science fiction of the year was established in 1987 by James Gunn, Founding Director of the Center for the Study of Science Fiction at the University of Kansas, and the heirs of Theodore Sturgeon as an appropriate memorial to one of the great short-story writers in a field distinguished by its short fiction. The award will be presented during the Campbell Conference Awards Banquet as part of MidAmeriCon II, the 74th World Science Fiction Convention, to be held August 17-21, 2016 in Kansas City, Missouri. 04-14-2016 at 10:34 AM Comments Off on “Damage” is a Sturgeon nominee! Things have continued to improve, slowly but noticeably, in the two months since I last wrote. Kate continues on 3mg of steroids and is gaining strength and balance; she is using the walker only part of the time now, and is working with a physical therapist once a week to continue to improve her strength, endurance, and stability. Also weekly: chair yoga and a scheduled walk with a neighbor (a weekly PT session via Skype is on hold due to the other party’s own health issues). She’s also been trying to do her home PT and go for walks every day. If you are in town and able to come over and walk with her, either regularly or one-off, it would be greatly appreciated. The other steroid symptoms are improving as well: puffiness, tremor, and diabetes are all somewhat better, though she’s still taking insulin once daily and bruises easily. She does have a bit of aphasia, memory problems, and cognitive issues but they are all much better than six months ago. Speaking of which, she had her six-month follow-up appointment from the root canal she had after her fall in August. Everything looks okay, though there’s some discoloration of the tooth and sensitivity to cold. Kate had another MRI in February and the scan looked very good, continuing to improve from the previous one. There’s no such thing as remission with this type of cancer, but the oncologist is pleased with her progress. The naturopath is also satisfied with how well she’s doing, and we’ve dropped back from monthly meetings with him to once every two months. In general Kate is much more proactive, energetic, and “present” than before. She’s been cooking, knitting (some), picking out new plants for the garden, and considering new exterior colors for the house (I can’t believe it’s been 22 years since we painted). The weather has been lovely, which makes it easier for her to get out of the house. In February we saw ten films in the Portland International Film Festival (my faves: “The Wave,” “Liza the Fox-Fairy,” and “April and the Extraordinary World”) and quite a bit of live theatre: “Great Expectations,” “The Wizard of Oz,” “Stupid F*cking Bird,” and “We Are Proud to Present…” plus a Springsteen concert. As for me, I’m doing well. 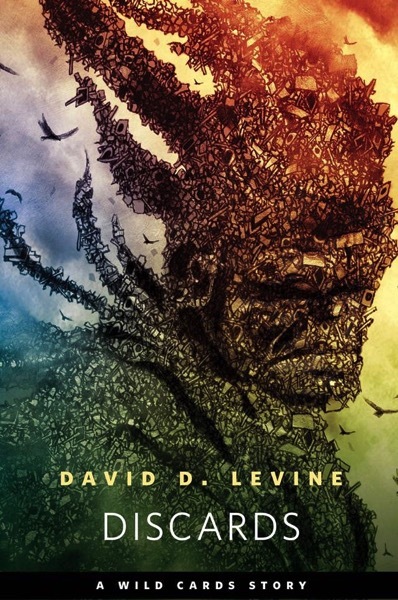 My short story “Damage” is a nominee for the Nebula Award, and is catching a lot of buzz for the Hugo; we will see in a few weeks what the Hugo ballot looks like this year. I am still plugging away on Arabella volume 2, but hope to have a finished draft very soon. I don’t yet have book tour dates, but will be appearing at Emerald City Comic Con in Seattle next Friday and the Nebula Awards weekend and Wiscon in May. No reviews of Arabella have appeared yet, but review copies have gone out and there’s already a certain amount of buzz. Thank you to Shannon & Mark, Bo & Don, Arashi, Camille, Mara, Geri, Ulrika, Kate & Glenn, Fran, Sara, Simone, Janna, Melissa, Moria, Kris, Kurt & Lorna, John, Merillee, Ariel, Cynthia, Allan, Marc & Patty, and everyone else who helped out, came for a visit, or shared a meal. If you are in town, please feel free to stop by for a visit, or just call and say hi.